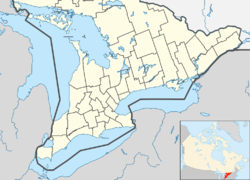 Addington Highlands (2016 population 2,323) is a township in central eastern Ontario, Canada, in the County of Lennox and Addington. Bon Echo Provincial Park is located primarily in Addington Highlands. Addington Highlands was formed in 1998 as an amalgamation of the former townships of Ashby, Denbigh, Effingham, Abinger, Anglesea and Kaladar. Addington Highlands contains Kaladar Pine Barrens Conservation Reserve and is near Puzzle Lake Provincial Park. This area was first settled following the construction of the Addington Road in 1857. It was originally named Scouten after its first postmaster. The old CPR rail bed passing through the town has become part of the Trans Canada Trail. Addington Highlands Township comprises the communities of Addington, Bishop Corners, Caverlys Landing, Cloyne, Denbigh, Ferguson Corners, Flinton, Flinton Corners, Glastonbury, Glenfield, Kaladar, Massanoga, McCrae, Northbrook, Rose Hill, Slate Falls, Vennachar, Vennachar Junction and Weslemkoon. The township's municipal offices are located in Flinton. Kaladar is located at the junction of Highway 7 and Highway 41. Addington Highlands contains the majority of Bon Echo Provincial Park. ^ a b c d "Population and dwelling counts, for Canada, provinces and territories, and census subdivisions (municipalities), 2016 and 2011 censuses – 100% data". Statistics Canada. February 6, 2017. Retrieved February 8, 2017. Wikimedia Commons has media related to Addington Highlands. Wikivoyage has a travel guide for Addington Highlands.